With our kidding season fast approaching, I believe it's time to highlight our last 2018 Sunday Spotlight: King's Rock Pickin' Violets! Between all of our Sunday Spotlights, we highlighted all of our 2018 milkers in some form or another. It seems very fitting to end with King's Rock Pickin' Violets, who will be our only milking yearling in 2018, showcasing the younger end of our breeding program right before the next generation arrives! I have to be honest and say 2017 was not a good year for taking pictures of our dry animals. When you are not trying to capture a filled udder, you can always just say "Oh I can grab a picture tomorrow." Well take it from me, it does not happen tomorrow either and so the "best" picture we have of Violet is a fuzzy Fall picture. 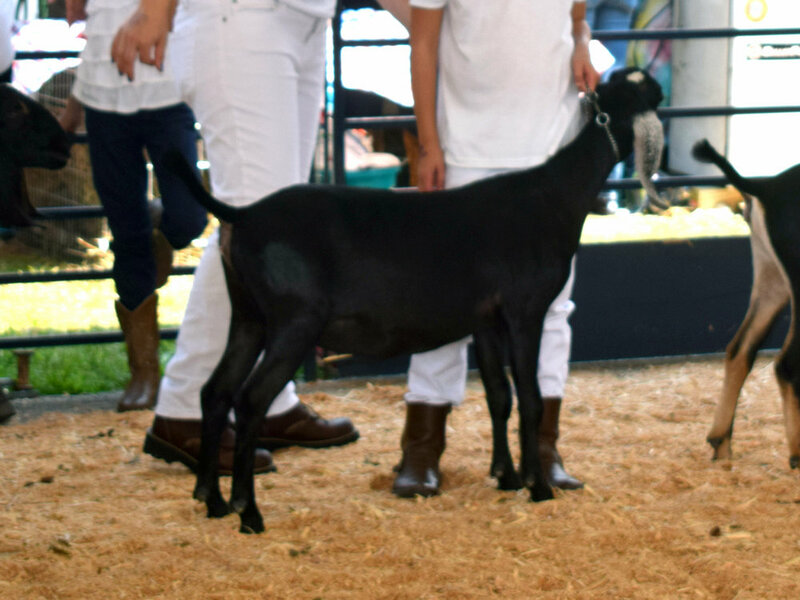 I also managed to find a few pictures in the show ring too that while not the best, do help to showcase her confirmation and appearance. Violet is the youngest daughter of King's Rock Betwix N Between 1*M and GCH Fox's Pride LFR Expresso +B. She is the full sister to King's Rock Pipin' Hot 2*M, our 2011 ADGA Nationals 1st Place Junior Doe and one of our all-time favorites in our herd. After Twix returned to our herd a couple of years ago, we bred her to CH Risin' Creek Wen Khaos Strikes, resulting in does King's Rock PuzzledNPerplexed 2*M and King's Rock Pomp&Circumstance. In 2017, after Twix short cycled on an AI, we bred her to Expresso, knowing he would get the job done and the kids would be fabulous. What resulted was a set of triplet doe kids, including King's Rock Pickin' Violets. We have never had the all black with white ears in our herd, and due to the fact that there was a potential crossover with AI/live cover, we had a potential case of "Who's Your Daddy?" and DNA'ed the kids to ensure proper representation of pedigree. Sure enough, they were all Expresso does! And while we do not keep does based on their coloring, Violet's coloring is just so sharp that it accentuates her elegance and grace. 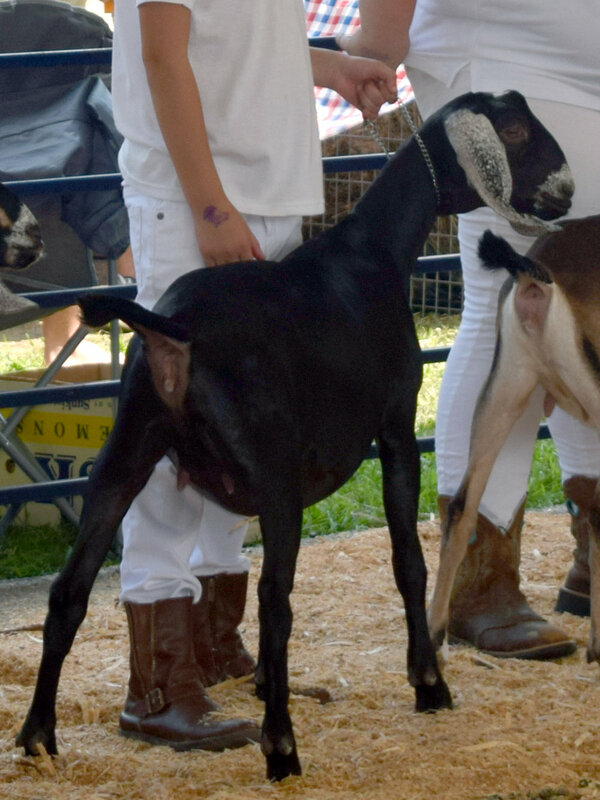 We only took Violet to a couple shows this year, and in one ring at the 2017 Progressive Dairy Goat Show, she was Reserve Grand Champion Junior Doe. She is a wide and deep doe, standing on great feet and legs, with sharp angulation throughout. I love her rump width and watching her trot across the pen really highlights her strengths. She is also the sweetest kid ever, very demure in personality, unlike our other two 2017 kids who are complete BRATS. I am so excited for her to freshen in 2018! She is bred to Fox's Pride KPC Get Your Wings, who is also very similarly colored so *maybe* we can get a repeat of her coloring in a doe kid just for me (fingers crossed). Coloring aside, these should be awesome kids! Wide, deep and long with lots of milk! My first GW kids will be arriving in less than a month and I am so excited to see what they look like. Violet's kids will be G6S Normal by parentage, and either Alpha Casein A/B or B/B. I am retaining a doe kid, but her second doe kid reservation is open. Since she is a first freshener, we do not offer reservations on buck kids but we do potentially offer them once the doe has freshened and been evaluated.